We quite often hear about the New Years resolutions that end in failure or nonfulfillment. Well, I want to hear about the ones that illustrate commitment, passion, and strength. Don’t you? We normally set goals that are difficult to achieve and don’t come with instant gratification. Well this year, I was determined to accomplish my New Years resolution. Up in 2017. Two inspiring women wanted to make a difference in the wellness and fitness industry, so they started an online workout studio. They provided daily workouts to women all over the world and also made healthy, easy-to-make recipes available. For the start of 2018, Tone It Up designed a 5 Day Detox that consisted mainly of a plant-based diet. Gluten and dairy were not included in this meal plan. I knew that it would be challenging to limit those staples for the next 5 days. But, I knew I could do it with a little bit of confidence and support. So my sister, her boyfriend Jarred, and I set our New Years resolution for 2018. We were going to complete the Tone It Up 5 Day Detox! After an intense trip to the grocery store, I was on my way to successfully completing the TIU 5 Day Detox. Before I knew it, Day 5 was rolling around and I was feeling so alive, ultimately giving me the motivation to keep going. I stuck with that same meal plan for 30 days and was so proud of myself for exceeding my original expectations. But I wasn’t done yet! I started to do some more research on healthy living and eating that could be easily attainable long term. I was also interested in learning more about the new diet fads and detoxes, such as juice fasting, intermittent fasting, and eating organic. It’s now over halfway through 2018 and I couldn’t be happier with my progress. I’ve completely changed my dietary needs by going vegan. I also enhanced my physical fitness by practicing yoga 5-6 times a week. After these life-altering changes, I’ve lost over 30 pounds. Even though it’s not all about the weight loss, it feels pretty damn good to witness that kind of progress. Overall, I’ve learned a lot about myself throughout this exciting journey. Eating healthy is not hard once you get yourself into a routine. Breaking bad habits and forming new ones is the first step to living a healthier lifestyle. 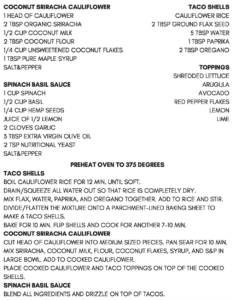 Also, experimenting with plant-based recipes is one of many other ways to keep things fun and exciting in the kitchen. 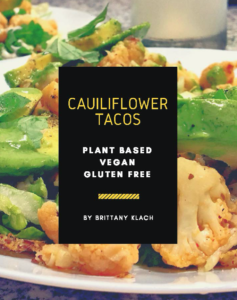 Here is the recipe for Cauliflower Tacos. As one of my favorite dishes inspired by Fresh Kitchen in South Tampa, it allows for a delicious, healthy alternative for lunch or dinner. I put a few of my favorite ingredients together and voila! Fun, easy-to-make tacos. 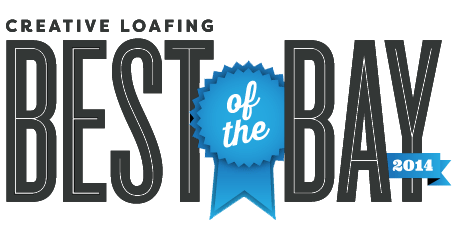 I hope you enjoyed my story and I look forward to hearing about more successes from the Bella Prana community. Always remember, your potential is endless!